The Asset Title is the title displayed in the Asset Grid (and elsewhere), Asset Title in the application and portal equals the Asset Name, or, if a Caption is entered - the Asset Caption. 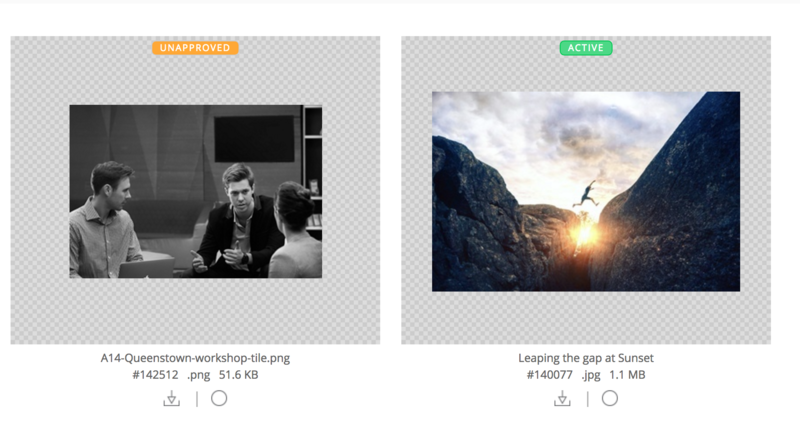 Add a Caption to the asset and the Caption will be display instead of the Filename (using the Edit Asset function). The Caption will be displayed in the Asset Grid and Asset Detail pages. The downloaded filename will remain unchanged (i.e. the original uploaded filename). Generally we recommend that you prepare your filenames before upload - so that on download they make sense, but while in the app the Asset title is used (i.e. filename or caption if enetered). We don't allow the actual file name that is stored to be changed once uploaded. Another way to update an Assets name is to use the Versioning feature to change the assets original Filename. Change the filename on your computer or device. Upload the renamed file as a new Version to the asset. With Versioning all the pertinent meta data of the original is kept and only the file specific data updated, e.g. filename, filesize, etc. We also have an advanced Base Name change function that will change the filename that is shown in the application and downloaded. Note that when sorting a search result (asset grid) by Title it will support a mix of filenames and captions - because Asset Title = Filename OR Caption. So an asset with a filename of 'abc.jpg' and no caption will be shown before an asset with a filename of abc.gif with a caption of 'Bcd' when sorting Title A-Z.